Jagannatha might be the ideal deity for millions of his devotees around the globe, but his one wife is not too impressed. Just within a fortnight of their wedding, he bathes too much and falls ill for 15 days. Immediately after, he goes out on a vacation with his siblings, not bothering to even ask her if she would like to come along. How insensitive! As one would expect, Lakshmi is not too happy. On the day of Hera Panchami, all of this gets out of hand. Lakshmi marches to the Gundicha Temple secretly and breaks Jagannath’s chariot in her fury. She scurries back through hidden ways again. Even then he won’t budge. About a week later he finally returns. On the day of Niladri Bije, the triad returns to the sanctum sanctorum from the Rathas. Balabhadra enters, Subhadra enters but when it is Jagannath’s turn, the door is shut. This is how Lakshmi decides to repay the unjust treatment doled out to her. And here starts the divine squabble between Lakshmi and Jagannath; wife and husband. This is known as the Lakshmi Narayana Bachanika or the Lakshmi Narayana Kali, ‘Kali’ in Odia referring to a verbal fight. This is not the only kali that exists in Odia culture. There are the kela-keluni kali (snakecharmer and his wife) and sabara-sabaruni kali (tribal couple) in the ancient Danda Nacha of Odisha. Even Parbati has a squabble with Lingaraja after the Rukuna Ratha Jatra, perhaps an emulation of the Puri model. This is the Hara-Parbati Kali. Our folk stories even have a Lakshmi-Parbati Kali song where both goddesses slyly tease the other’s consort and their eccentricities. In the Puri temple tradition, Lakshmi also keeps nagging poor Saraswati. This is a peculiar humanisation of divinity and everyone derives a lot of enjoyment from the unlikely scenario. The Lakshmi Narayan Kali itself has various retellings. Balarama Dasa, Jagannath Dasa, Gauracharana Dasa, Pindika Srichandana, Bipra Maheswara and many other poets have written their own versions of this squabble. That just goes on to explain how popular the storyline used to be. It still is. In Gauracharana Dasa’s version, Jagannath decides to keep his cool and stay quiet when Lakshmi scolds him in anger. Lakshmi does not hold back; she scolds him for being with the gopis and takes a dig at Subhadra, who she calls ‘her majesty, a milkman’s daughter.’ Jagannath laughs all the while, chuckling at her complaints but when she scolds the gopis a bit too much, he points out her excessive pride and how her father, the Mahodadhi sea keeps ‘roaring’ all the time. Atibadi Jagannath Dasa was the creator of the magnum opus Bhagabata in Odia. He lived in the 15th century. In his retelling, Lakshmi calls out Balabhadra for being too laconic and afraid to confront the reality. That is why, in her opinion, he gets away first in his Ratha, unconcerned that his young brother is ignoring his wife. When he returns, Lakshmi conspires with Indra, telling him to ‘throw hailstones on earth’. Poor Jagannath is all exhausted and wet. He almost catches a cold and his lips shiver. Lakshmi tells him ‘be there like you left me!’ and leaves the scene. Jagannath meanwhile bribes the servitors and enters inside. He finds Lakshmi sitting in a corner, angry and unwilling to talk. Here comes the placating: he shows her the kalameghi saree he has brought for her from the market; the various types of ornaments kanaka dudura, banka daunria, padakamala and suabasa nakachana. But she is not amazed by the shimmer. They enter into another argument until Balabhadra interferes. Afraid, both of them now become quiet. Jagannath himself adorns Lakshmi with all the ornaments and asks her to forgive his faults. Lakshmi also joins her palms in a gesture of humility. Quite notably, Jagannath offers her a sweet rasagola to pacify her further. 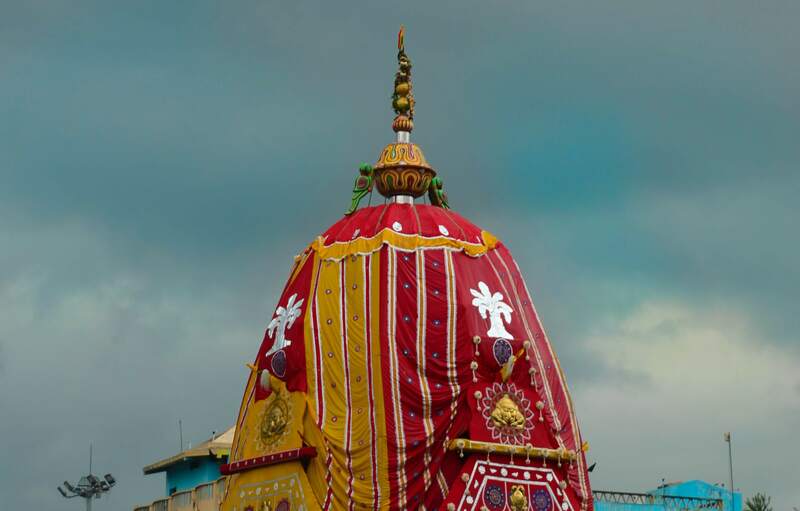 Mentioned in 15th-century Odia texts like the Dandi Ramayana, the Rasagola has its origin in this ancient ritual of the Jagannath Temple of Puri. Sweet tale, isn’t it? Here ends the majestic Ratha Jatra.